Below is my attempt at the second script of the “Four Scripts (#02)” lighting challenge; C&C’s welcomed and appreciated. Z-Depth, OpticalFX, Ambient Occlusion and Beauty. Photoshop post-processing, saved from FCHECK to .TIF and .JPG (.JPG posted). Nice arrangement for the kitchen; just the right amount of “busy”. The shadows seem to indicate that there is a strong (key?) coming from multiple sources. 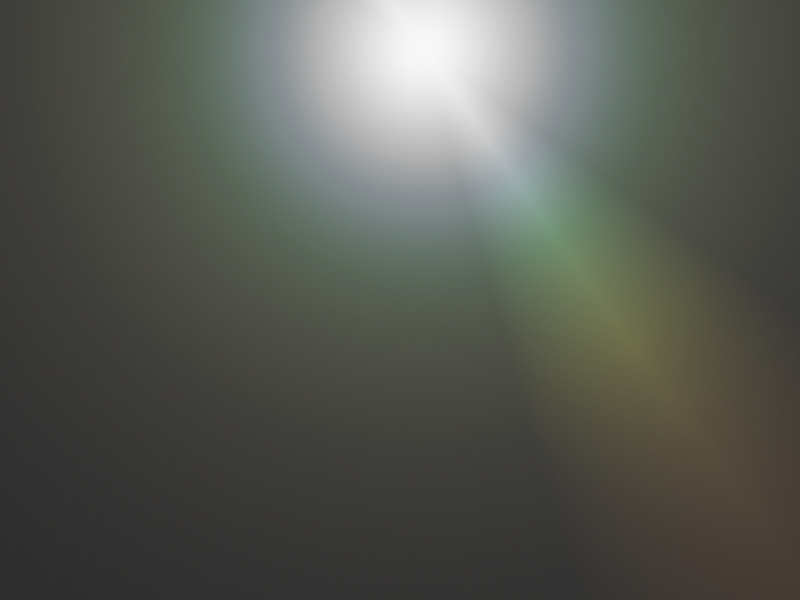 Should the bits of specular on the objects on the left side (dark) of the image be there? The light from the patio doors seem to give the impression of coming from a light, yet the image in the window makes me think that beyond the patio doors is an open area. The shadows of the objects on the table make me feel like the stronger light source should be from the window. Interesting “feel” on this one. 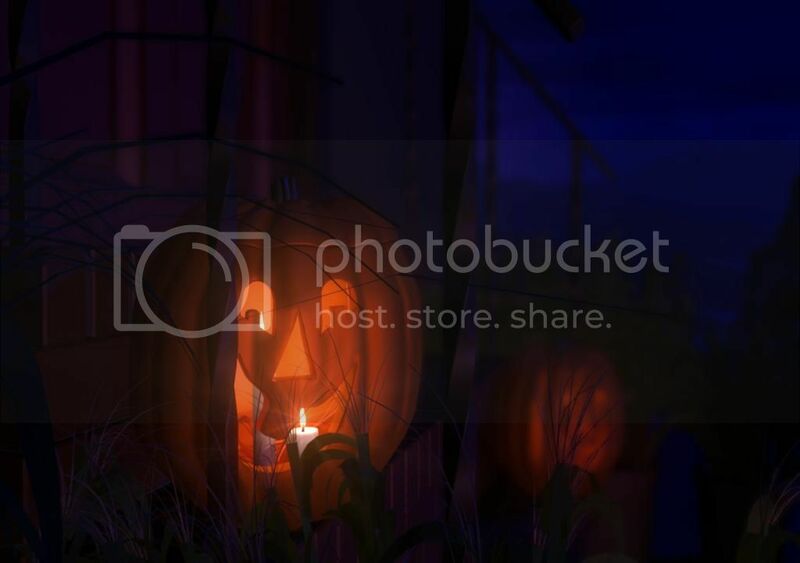 Is the smaller candle inside or in front of the pumpkin? Interesting angle on the camera; nicely done! The blue lighting seems a touch overpowering leading me to think that it’s missing on the lamp illuminated wall sections and floor. I’m wondering if a bit of additional dropoff/decay on the lamp would be in order? The kitchen is a nice start also, but it seems like it has 2 suns. The sun from the left is brighter, maybe keep that one, but then think about the sun direction on what you see through the back window, and the other sun casting shadows on the table doesn’t look motivated at all. Halloween that metal bar on the porch and grass in the foreground all looks transparent to me, as if the pumpkin was bleeding through the foreground layers. If the light comes from a candle inside the pumpkin, then the inside should be much brighter than the outside. The pumkin on the right has the same problem, the inside doesn’t look much brighter than the outside, it even has the same color as if the texture inside was the same, and it seems more blurry than the far background - how could something a few feet into the background get so much more blurry than the foreground, if the clouds and trees far away aren’t as blurry? The sky color is nice, but then there’s more sky down on the lower right for some reason? Good start on Haunted Hallway as well, I think you need to work on shadows and occlusion there. 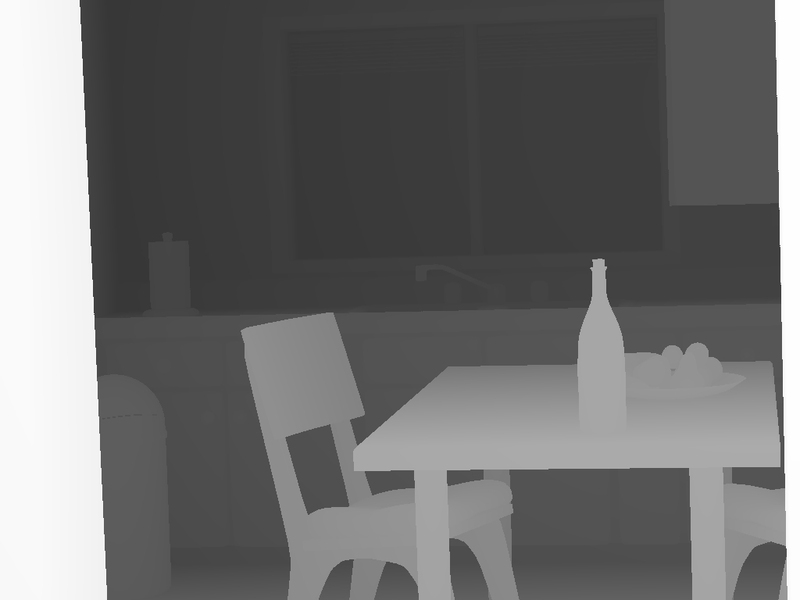 Good start on the kitchen scene. You’ve certainly got the right idea to make it look bright/glaring to capture the feeling of the guy with the hangover. That occlusion pass needs work. Maybe the max distance is too low, but work on it until you get nice gradients in shading ramping into the corners where the walls meet. An area like that alcove above the kitchen counter but below those upper cabinets, that kind of alcove should be shaded darker in the occlusion pass. You don’t just want something that makes gray lines tracing the corners and edges, you want shading that’ll contribute definition to your scene. Once you’ve got a good looking occ pass, it helps if you render your fill light as a separate layer, so you can start with the fill layer, then multiply it with your occlusion, so the occlusion adds shading and a look of soft shadows to the fill. After that, add the key layer (the sun light with its own shadows) on top of it, so the key isn’t influenced by the occlusion, only the fill light underneath the occlusion gets shaded by the occlusion. If you’re going to include chrome reflective surfaces in the scene, like the trash can, then the look carefully through what’s visible in those reflections for the color of windows and doors, the other shaping and colors there. The floor needs work, maybe some reflections, but certainly at least some shaping getting darker towards the edge of the cabinets. It’s as if the light hitting it isn’t shaped by occlusion or shadows now, although fixing up the occlusion will probably do a lot to help your floor. Thank you for taking the time to provide comments/critiques. Duly noted. I did set my current AO “Max Distance” quite low so as to apply a conservative amount of AO. I’ll relax the settings and work on the gradients and shading into the corners. I have all of the lights as separate layers; I assume you mean I should create some additional rendering layers to breakdown the fill and key lighting as passes. Even though I’m very much aware that most work is composited using other tools in the pipeline; I’ve been struggling with the guilt of having done some post-processing work in Photoshop to put it all together. Was there something specific that struck you as odd? I’ve been looking at this scene so much that I’m at the point of not seeing the “reflection for the trees”. Good catch! The floor is a bump map and I just realized that I’m not passing it through to AO; I’ll go back and hook it up properly so as to obtain an AO. I intentionally reduced the relfectivity of the floor - obviously by too much. Your chrome reflection feature a very harsh line between a flat shadow-tone area and a flat sunlit area, there’s no shaping or shading. I’d expect gradients there. And there are empty black doors that look like a hole in your scene. As an exercise, try hiding the direct sun (pretend for a minute that it’s a cloudy day, or the sun is on the other side of the building) and just render the scene with the fill light from the sky. That fill light is always going to be there on a bright day, whether there happens to be a sunbeam coming through this window or not, but just look at the soft shadows, the gradient it makes on the floor, how that grad looks in the reflections, etc. Later you can add the direct sun and other fill lights too, but just isolate the soft fill from outside, I don’t care if it’s an area light or a portal light or how you do it, but make sure that’s working in isolation and that its shadows still look soft enough in the reflections. If you’re already rendering your lights as separate layers you’re all set. Add together the interior fill lights, then multiply those by the occ, then add the sun light and sky fill on top of that. Retouching is fine, but the issues I’m talking about involve going back to the scene and adjusting the lights and render layers. …Retouching is fine, but the issues I’m talking about involve going back to the scene and adjusting the lights and render layers. I’m looking to complete scripts #03 & #04 using this scene … so this is welcomed help; thanks for clarifying. Will take a day or so to experiment and read a bit more on how to apply all of your recommendations. To date, I have been working with Maya Lights and the standard shaders … discovering (learning) about some of the limitations in doing so. When I move to challenge #03, I intend on using Mental Ray lights and materials. Without sounding too weird, I do sincerely appreciate your help … quite an inspiration, wish I could have started this journey 10 years earlier. I re-evaluated the scene and m reworking it now…definitely need to fix the bg and window light!will post the results in next post! @jeremybirn - could you help out a bit more on this please?? The image u shared looks great however how do i add more color to the shadows???texturing?? don’t see how it can be through lighting… srry for the trouble! once again thank you guys very much for critiquing my work!! [ul]the dustbin is much too reflective…u should add more blur to it and should tone down its reflective color.and it looks way too clean…add some dirt on it maybe?? too CG right now unlike the rest of the scene. [li]give variation to your wood texture and add bump maybe. [/li][li]the wine bottle seems a bit blurry to me. @how do i add more color to the shadows???texturing?? don’t see how it can be through lighting… srry for the trouble! The places where your key light (the main light) casts a shadow, you can still have fill light (other lights) illuminating those areas, and you can control the colors of your fill lights. That’s the only simple answer. 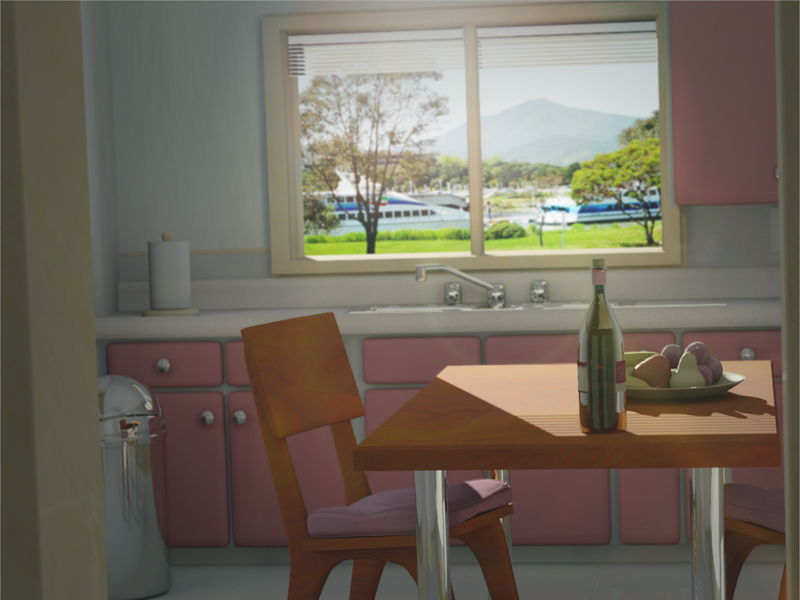 A fancier solution would be to render a colored ambient pass of the scene, then an occlusion pass, then a key light pass with your main lights in it, and in compositing make sure the colored ambient multiplied by occlusion and also richly saturated where its darkened, then add your key light layer on top of all that. But if what I say in this paragraph sounds complicated, really just try using colored fill light to color your shadow areas. Much appreciated. I’ve dissected Jeremy’s comments down to about 15 points - of which I’m working on … the adage “be careful what you wish for” comes to mind. the dustbin is much too reflective…u should add more blur to it and should tone down its reflective color.and it looks way too clean…add some dirt on it maybe?? too CG right now unlike the rest of the scene. I’ve been reworking the fill lights over the past few days to try and reduce the sharp shadow line that appears in the trash can reflection - shadow on floor from counter blocking light. Just can’t seem to get a satisfactory gradation happening; once I get that sorted out, I’ll look to increase the Blur a bit on the Chrome shader. give variation to your wood texture and add bump maybe. Are you referring to the table and/or trims? I have a bump applied (.001) to both; I’ll have a go at increasing a bit to see what it looks like. the wine bottle seems a bit blurry to me. I offset the entire scene to give the impression of vision divergence; maybe I need to increase the offset? Most certainly open to a different approach. okay here is the updated version…what do you think?? 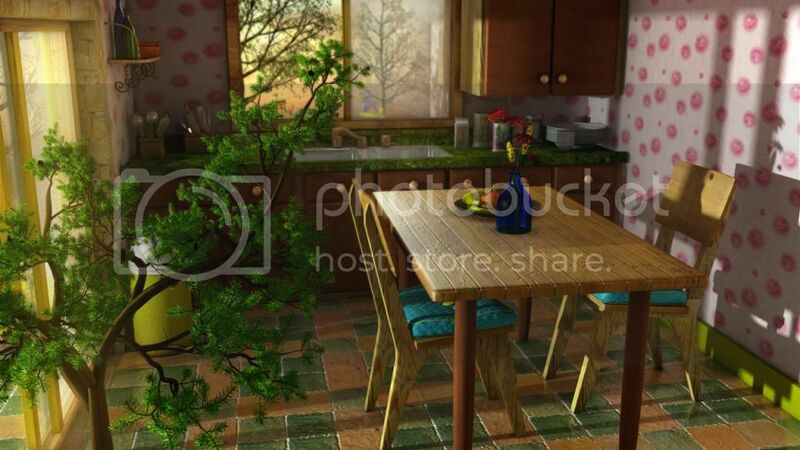 @ hgagne-table and trims both.try to get a more “woody” feel. Below is my revised attempt at the second script of the “Four Scripts (#02)” lighting challenge based on comments posted here. Many thanks for the feedback - extra knowledge is always a “good thing”. I’m interpreting the following Maya Documentation as indicating that I should not have increased the FALLOFF value over 1.0. Yet, unless I do so, I can’t seem to obtain a workable gradient. Could this be a result of having my scene units of measurement in Centimeters? FALLOFF: only matters when max_distance is nonzero and defines the speed at which the occlusion is attenuated by distance. Technically, it is a power function applied to the normalized distance from 0 to max_distance. The default value of 1.0 is a linear falloff. Values below 1.0 makes the falloff more rapid. Practically this means that for lower values occlusion is stronger for short distances (in small corners and crevices) and softer over larger distances. Separated the Fill/Bounce lights into a render layer which is multiplied by the ambient occlusion render layer. I composited three layers in PS: FILL/BOUNCE (normal) + AO (multiply) + KEY (screen). And there are empty black doors that look like a hole in your scene. Added “blocker panels” to Hallway, Living Room, and Window. I added a separate point light to illuminate the “blocker panels”. The light placement does not show the “blocker panels” and the point light. I revised all of the lighting in the scene as I kept encountering artifacts in the shadows of point lights - even with large raytrace values. I’m interpreting the Maya Documentation to indicate that the Light Radius should never exceed the value of 1. Many of the tutorials (Books, DVD, and online) always show instructors raising the Light Radius to values in the range of 16 or higher. Shadow Radius, Light Radius, Light Angle: The Light Radius attribute is only available for point lights and spot lights. The slider range is 0 (hard shadows) to 1 (soft shadows). The default value is 0. Your chrome reflection feature a very harsh line between a flat shadow-tone area and a flat sunlit area, there’s no shaping or shading. I’d expect gradients there. Part of the harsh line is shadow from the table edge and chairs. I moved to Area Lights in an effort to gain better control. Looking at the overall scene, the transition from shadow to non-shadow is smooth - I still find it’s not looking quite like I’d expect it to in the reflection … even though I created a new chrome material from scratch. Reviewed the MIB_AMB_OCCLUSION Maya Documentation again; from what I’m understanding now, the REFLECTIVE option creates a “Reflective Occlusion” when selected - otherwise it’s “Diffuse Occlusion”. Is that correct? And when I create the separate “Reflective Occlusion” render pass, should I look to include specific geometry or should I include all of the model once again? Also, won’t the result of multiplying both AO render passes cause a darker than desired result? the dustbin is much too reflective…u should add more blur to it and should tone down its reflective color and it looks way too clean…add some dirt on it maybe?? too CG right now unlike the rest of the scene. Created a new chrome material from scratch. Increased the BUMP from .001 to .005. Slightly adjusted the Specular Roll-Off and Reflectivity. I couldn’t go much higher without having to redo the entire material. I had added an offset version of the image to created the effect of visual divergence. I removed the effect and left it with DOF only. The comp still looks a little flat and uniform to me. 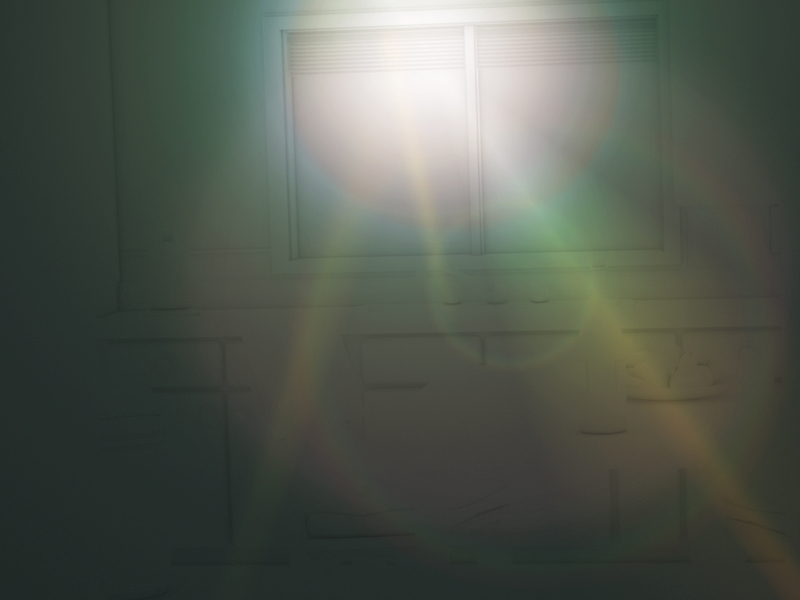 It seems as if you have a lot of fill/bounce light coming from inside the room, then a sunbeam, but otherwise no light from the sky coming through the window. In fact, parts of the windowsill (right under the window, just to the left of the sunbeam) look darker than the floor under the cabinets – that couldn’t be right. Without the sun or any interior lights visible, work on the fill light from the sky, if it’s an area light in the window, just outside the window, a portal light, or however you want to do it. Make it look as if the light is coming from outside, pouring in through the window from all angles. The sunbeam is only one angle, but if you look at the window it looks bright out there from all angles. For the occlusion, maybe try a falloff of 2, and a spread of 1, and you might need a higher max distance – how many units high are the walls in the room (the floor to ceiling distance)? Use about half that amount as the max distance, but raise it if it is still too low to get nice gradients. In Maya the Light Radius is just another way to make raytraced soft shadows. On an area light, you make the raytraced shadows softer by scaling up the area light. On a point light, you type in a light radius, and it’ll cast raytrace shadows as if the light were an area light with that size radius. For example, a light radius of 30 would be like having a round area light with a 30 unit radius. From where your scene is now, though, I think you need to turn down the brightness of your interior fill/bounce lights (you could do this in the comp), improve your occlusion pass, and then multiply the fill/bounce layer with some occlusion, and that’ll give you nice fill light with some soft shaping to it. Then add soft fill light from the exterior coming in through the window (a big area light might do it), and add your sunbeam. See how far that gets you before you worry about shadowing from the interior fill lights or any other issues. Nice work. What I see outside the window looks like a very foggy, softly lit scene. I don’t know if there would be such a sharp sunbeam coming in through the side window, or if it would be coming from such a low angle. For that kind of soft lighting, though, you really need to work on soft fill light from the sky coming in through the windows and glass doors, maybe from area lights outside. The comp still looks a little flat and uniform to me. The light coming through the window should be overpowering. Visually guide the viewer from the window to the bottle. Slight blur and tunnel vision effects. and mostly importantly, a believable scene. … IMO, I’m not achieving most of these points in the second attempt, the first attempt was somewhat closer but still not quite there. so as to keep my posts (aka clutter) down as much as I can so as to keep the thread relevant and useful. Realize this means that the edits may be overlooked. as expanded notes to these points for future reference assuming the thread/posts remains around for a bit. as extra information for other newcomers who are trying to learn and grasp the subtleties of lighting. It seems as if you have a lot of fill/bounce light coming from inside the room, then a sunbeam, but otherwise no light from the sky coming through the window. After the Direct Light (sun), the Area Light (window fill) in the window is the second strongest light. When I disable all lights except the Window Fill (#04) light, the Window Wall is completely black and the shadow from the counter to the floor is as I would expect. The light is colored to match the sky color in the image - light blue. Q: Am I off the mark? Should the light not be illuminating the inside wall with the Window? In fact, parts of the windowsill (right under the window, just to the left of the sunbeam) look darker than the floor under the cabinets – that couldn’t be right. I think I see what you mean; not just directly under the cabinet lip but also the shadowed area on the floor. Without the sun or any interior lights visible, work on the fill light from the sky, if it’s an area light in the window, just outside the window, a portal light, or however you want to do it. Make it look as if the light is coming from outside, pouring in through the window from all angles. The sunbeam is only one angle, but if you look at the window it looks bright out there from all angles. I’m going to go back and rewatch your DVD tutorial on lighting the kitchen to see if I can figure out where I fell off track. 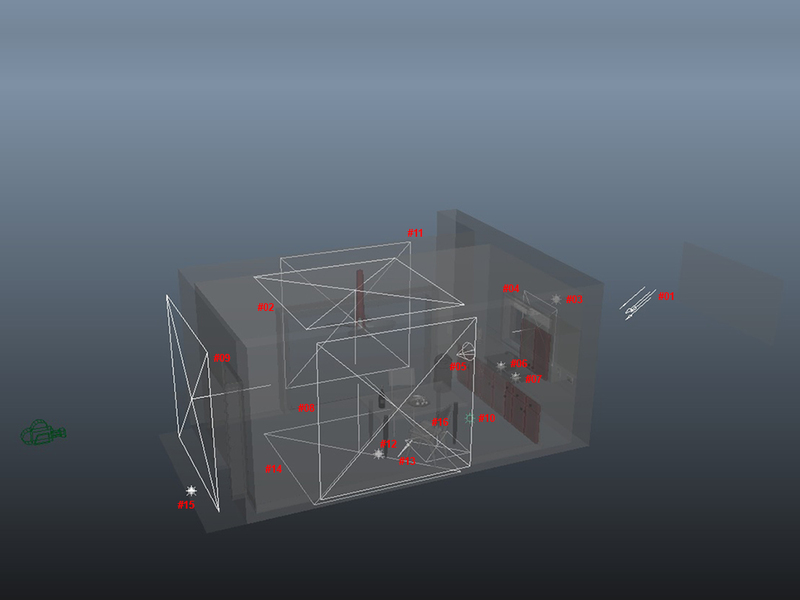 The scene is currently in Centimeters - the default when I opened the downloaded kitchen scene. I’ll double-check the wall/ceiling/floor units and extrapolate an amount. I had to use raytrace values well over 128 before I stopped seeing artifacts - similar to what you show during your DVD kitchen tutorial. Q: In other words, my radius shouldn’t not have exceeded the unit count between the left/right walls of the kitchen? Lots to digest in this paragraph and I think I’ll have a few questions but not sure what they’re going to be yet … thanks for being patient and helpful. I’m going to go back to the scene and rework the intensities of the lighting setup for the second attempt. IMHO, that’s where I should be focusing on improving my skills/knowledge - the foundations; I can get creative in Comp later. Guess I need to push myself a̶ ̶b̶i̶t̶ harder on this one. 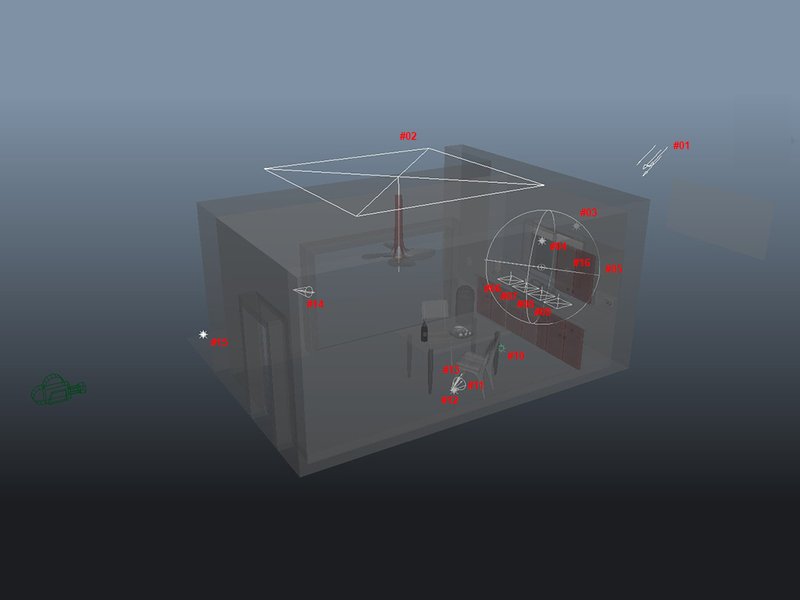 When I set out to learn lighting via Maya, I started with the concept of direct illumination - i.e. standard Maya Lights/Materials. 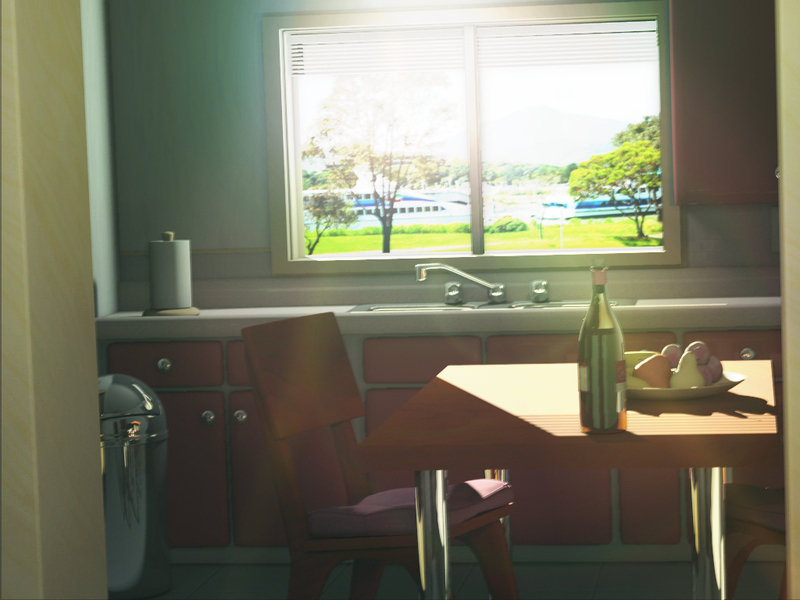 I had to move to Mental Ray (MR) rendering as I couldn’t obtain the effects I wanted for glass + shadows. I’ve also set the MR renderer to Legacy Sampling (not the new Uniform Sampling). I also wanted to build skill using traditional lighting (even though it may be so ‘2002’) as I felt the foundations were important … maybe I’m incorrect in this approach, but non-the-less, I’m looking to finish all four scripts of the 2nd Lighting Challenge with this mindset. With what I have learned to date, it’s apparent I should have created all my materials using MR materials and lit the scene using MR lights and rendered using Uniform Sampling. I’m not clear on exactly what you were testing there with those images. The 2 things I was suggesting were that softening the light would help match the foggy day better, so you could try softening the main light coming through the side window a little, and also that you could use more soft fill light coming through the windows (perhaps from an area light or portal light in each window) simulating soft light from the bright foggy outside entering the windows. I’d be able to notice if you had softened the key light, becayse the shadows on the right wall would be softer. If you have soft fill light coming in through the window and side doors, you could try rendering that in a separate pass and posting an image of your soft fill from the outside, all by itself, so we can discuss that in isolation from any other lights.